Here's what some of The Escapist's most passionate science and tech enthusiasts picked for their five favorite things from 2014. 2014 saw some big headlines in the world of science and technology - topics we've gleefully covered on our science podcast. From historic events and major breakthroughs to stories that raise eyebrows or induce laughter, here are my five favorites of the year. If you've never seen a meteor shower, it's difficult to relate the majesty of the spectacle. I saw my first shower in summer 2013 - the August Perseid shower, which my friend and I serendipitously happened to witness while lying on a grassy hill, staring up at the sky, unaware that we were in for a light show. But Spring 2014 marked a historic event for stargazers: the first ever Camelopardalid meteor shower. Almost 200 years ago, a comet left a dust trail in space, and that trail was only pulled into Earth's orbit this year - by Jupiter's gravity, no less. While I didn't witness the resulting meteor shower myself, and am given to understand it wasn't as flashy as the Perseids, everyone who did see the shower will be able to say, for the rest of their lives, that they bore witness to the naissance of an annual cosmic event. Read more on the meteor shower here. In 1964, a particle was theorized that would be instrumental to our understanding of physics: the Higgs Boson. A 40 year search to prove its existence was launched, which culminated in the construction of the LHC, the world's largest particle accelerator. In 2012, physicists found a particle matching many of the expected properties of the Higgs Boson - a monumental discovery. However, in order to be certain, the particle had to meet a list of five requirements. In 2014, after thorough analyses, a fourth requirement was met, leaving only one requirement before it can be said with certainty that the particle discovered is the Higgs Boson - a requirement that can only be studied once the LHC is upgraded in 2015. Nonetheless, to be one step closer still to checking off the final box is exciting, as it will conclude the 40 year treasure hunt. Just don't call it the "God Particle" - you'll get everyone upset. Read more on the Higgs Boson here. Headlines about a giant mystery holy found in Siberia's Yamal peninsula this summer had me grinning. While speculation over the hole's origin abounded, scientists ultimately had no concrete explanation for the phenomenon and needed to organize expeditions to gather more data. It's the perfect premise for either a sci-fi or horror flick - take your pick - and the best part of it all is that the region's name translates to "end of the world." Ominous! 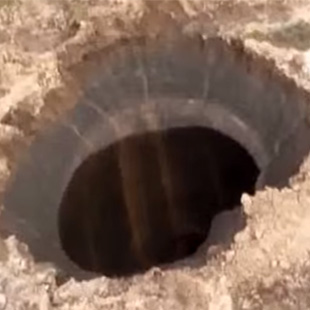 The hole was up to 300 feet deep and almost 200 feet in diameter, with an icy lake at its bottom. The most likely cause is believed to be rising temperatures in the area that caused an "ejection" in the region's permafrost - rapid melting of under-soil ice released gas and caused an effect similar to the popping of a champagne bottle cork. Isn't it hilarious, then, that we can blame this on global warming? Read more on the Siberian mystery hole here. Shortly after the launch of the iPhone 6, a very official-looking infographic purporting to be from Apple started making the rounds, detailing one of iOS8's new features: Wave, which allows you to charge your phone wirelessly by putting it in your microwave for a minute. What followed were a number of incensed (former) iPhone 6 owners taking to Twitter and posting pictures of their "shockingly" destroyed devices. While some reports later claimed that the hoax was a hoax - in other words, that no one actually believed the hoax and that the "victims" were hoaxers themselves - the thought of people microwaving away a $1000 piece of technology makes me giggle sinisterly. What really sold the idea were the directions: "60 seconds at 700W or 70 seconds at 800W. Do not Wave-charge for over 300 seconds" Those little details are what add that extra layer of authenticity to a hoax. Read more on this tech hoax here. Let me preface this by saying that I am not an American citizen and have no political opinion of President Obama. I remain willfully ignorant about his platform and why people love and/or hate him. That said, with Obama being in his final term, he no longer needs to win a popularity contest with the American voters, and yet he still chose to come out with a strong stance in support of net neutrality by calling for the internet to be reclassified as a utility. This would put a definite end to this whole "fast lane" and "slow lane" - rather, "super fast lane" - nonsense. If, by chance, you're not up to speed on the very important net neutrality issue, then John Oliver spells it out in a very entertaining way. Read more about Obama's stance on net neutrality here. So those were my five favorite events in the world of science and technology in 2014. There are a handful more that didn't make the final cut - including saying farewell to the USS Enterprise, the world's first nuclear-powered aircraft carrier - and here's to hoping that 2015 will provide me with some more difficult decisions to make when whittling down a top 5 list. Click here for a separate list of the most significant events in the world of science and technology in 2014.